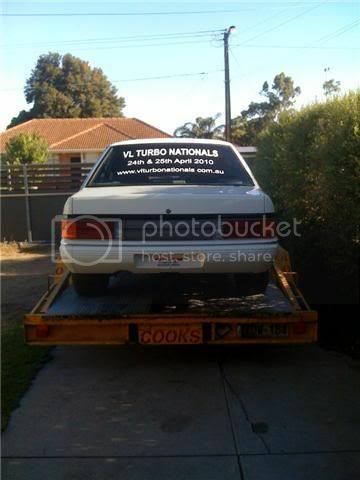 Did a little bit of window advertising when i took the car to Whyalla drags on the weekend. Had some good responses. I am currently in talks with the People here in Adelaide who are fighting for a drag strip. They have asked me if i want to enter a couple of cars in there upcoming Port Adelaide street blockade. Perfect time to do some more advertising to grow the numbers for the VLTNATS i thought. Last edited by XCHASE; 08-02-10 at 22:52. Just arrived in Bendigo found an AWESOME place to stay. Looks very secure for car parking and the Owners are very polite and helpful. I highly suggest getting on there website and book ASAP. Book now and tell them Steve sent you. In bendigo for the nats already? That is keen! What a trip. Short, Sharp, Sweet and Successful. Had a interview with ABC radio which will be aired on Monday, Have also the support from the local Bendigo Council and they seem very interested to help support the cause. Met with about 20 people over 2 days including television stations and weekly paper and also Mgivor Times. Ben from the paper met me out at the track. Took some pics of my ugly mug and jotted down a heap of details to run a news story very soon. Dropped off over 2000 counter top flyers and visited nearly all the local car part shops. Most of which were more than happy to put up our poster in there windows. Also struck a couple of great deals which i cant mention until we have them in writing regarding some of the local venues. Will post as soon as its confirmed. But none the less very exciting. Also met with Local CT user PISTOL. He is now our Bendigo contact so if anyone needs posters or has any further ideas im sure he is willing to help Contact me and i will direct anything to him. Thanks Paul. FIRST 20 PEOPLE TO PAY AND ENTER THERE CARS WILL HAVE FIRST ACCESS TO THE CARPORTS. Im letting only Calaisturbo members know this in advance. As a special offer to CT members. Although when they go on sale it will be first in best dressed. So thats 2 days undercover at Heathcote raceway. Get in quick remember only the first 20 paying customers through our website get priority to the carports for the weekend. Last edited by XCHASE; 15-02-10 at 17:12.
cant wait for this event, make sure you all get behind this event to make it big so it can happen every year. Sorry if this has been asked. But can you purchase tickets on the day? Yes tickets can be purchased on the day. #PLEASE NOTE# We are doing them at an early bird special for those who pre-purchase. This applies to all entry's. Any further questions please enquire in this thread. Last edited by XCHASE; 16-02-10 at 22:21.
cars in paint atm so hopefully HOPEFULLY shel b ready in time for the drive over will b such a good weekend! ill be coming how do i get a ticket. IDEA: I am looking into a very popular nightclub in Bendigo. Im looking at organising a room for up to 250 private guests. I guess we could almost call it a CalaisTurbo private function. This would be on Saturday night. Looks like they are prepared to do free and express entry and a decent % off on all drinks over 3 days. Friday ,Saturday and Sunday night. Does this interest any one???????? Ok to back that one i need to know if anyone would be interested in a Bus charter. Pick up from the track. Im looking at organising this to be a pick up Saturday night one @ 6pm and one @ 8pm. Drop off to main street Bendigo. Also have 2 pick up services. One @12am and one @ 2am. At this point it looks like it would be at the cost of about $15 per head. This being the safest mode of travel. No risk of parking your car in town, Less risk of getting defected or DUI but most importantly we can stick together as a group. Looking at trying to get a pub on board to offer us some specials in town close to the club. Maybe see if they can throw together a VLTNATS meal maybe a beer and burger combo for us, This way we can get dropped at that pub straight off the bus have dinner and a drink then go to the club. Would appreciate your thoughts guys! Would you like the charter bus etc??? Would appreciate some feedback guys? Last edited by XCHASE; 04-04-10 at 09:17. Less colourful typing... My eyes are hurting from all the different colours . In all honesty, Carn guys get in and support, this is going to be great! More interstaters need to get on board and stop being soft! security will be a must steve. night club in my books mmm maybe was fun last time going 1 to the other. bus home would rock beats waiting for taxi..
pub for meals sounds like a good idea for sat night..
hey i've heard theres going to be a few manual turbos heading out. Does any one know what the record is for manual t3 is???? Anyone else haven any feedback? Pubs sound like a great idea! I wont be able to get into a night club LOL, ill be 1 month underage! But a pub dinner sounds great! And I heaps love the idea of the buses! All sounds fantastic Steve, c'mon everyone get behind this, it's gunna be huge, and if anyone has any good places to handout flyers, hang posters, Im sure XCHASE can get some to you, DONT BE AFRAID TO ASK HIM. twill be a weekend of VL bliss & lots of piss!! somebody shout me and say there my uncle! haha!